This is a useful one page graphic organizer worksheet for practicing the simple, progressive, and perfect tense conjugations. There are two fill-in-the-blank charts that students can complete alone, or the top chart can be completed as a supplement to the lesson, and the bottom chart can be used as a student practice sheet. 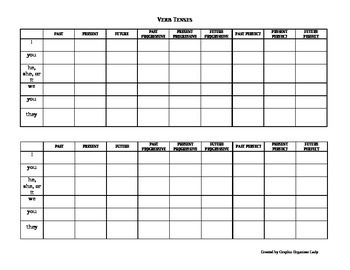 This organizer can also be used as a quiz or test to assess your students' mastery of verb tenses. For interactive notebooks, simply copy at 85%. UPDATED 10/19/14: Added future progressive tense and slight change in format.